Moritz Eggert was born in Heidelberg in 1965. As a pianist he regularly collaborates with many artists, as soloist with orchestra, as chamber music partner in various formations and as a Lied accompanist. In 1996 he presented the complete works for piano solo by Hans Werner Henze for the first time in one concert, in 1989 he was a prizewinner at the International Gaudeamus Competition for Performers of Contemporary Music. As a composer he likes to defy any kind of categorization, thus managing to irritate both avant-garde and classical audiences. 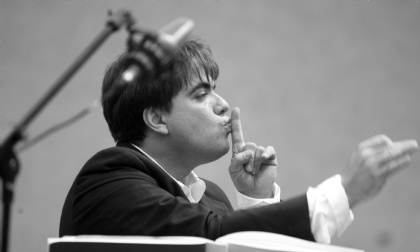 In projects such as “Die Tiefe des Raumes” (a football oratorio) or “Freax” (an opera realized in collaboration with Christoph Schlingensief), which receive a lot of media attention, he constantly endeavors to undermine the public image of New Music as a matter for experts only. In 2010 he finished a “Bordellballade”, or “Brothel Ballad” (in collaboration with the Austrian writer Franzobel, winner of the Ingeborg Bachmann Prize), commissioned by Weill-Fest Dessau, Theater Koblenz and Neuköllner Oper Berlin. For the Pop Duo 2raumwohnung he created new songs as well as orchestral remixes. Since recent years he has also incited a heated discussion about the state of contemporary music, both as creator of the “Bad Blog of Musick” and in articles and lectures for various publications. Among his recent projects are an international collaboration with Belgian artist Jan Fabre, new operas for Bremen (“All These Days”, Premiere April 2012), Berlin (Komische Oper) and Regensburg and a “Faust”-project with German TV talk show host Harald Schmidt and the Bochumer Symphoniker with Steven Sloane. As a pianist and performer Eggert is a fervent advocate not only of contemporary music but also of the classical repertoire, especially Lieder and chamber music. In October 2010 he took on a composition professorship at the University for Music and Theatre in Munich, Germany. Using a Mozart Quintet as a starting point, Moritz Eggert designs a new, contemporary world of sound: »Amadé Amadé«. A musical exorcism – and a col legno production made to measure!